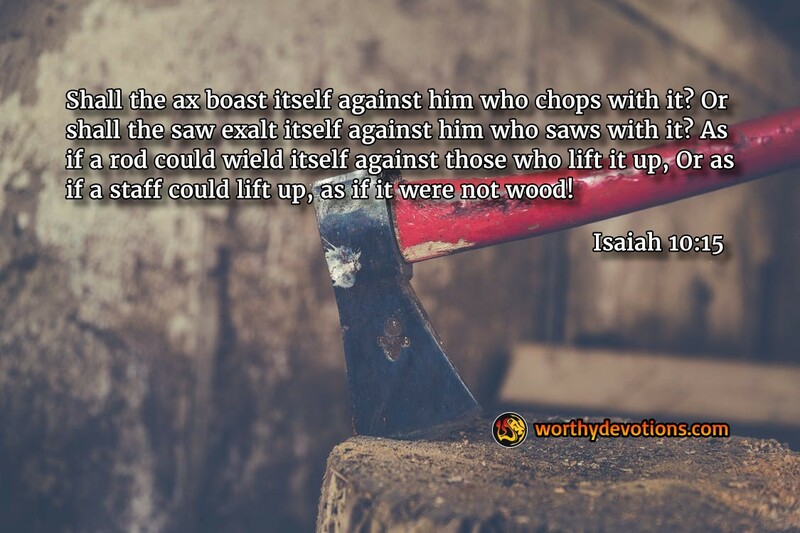 Isaiah 10:15 Shall the ax boast itself against him who chops with it? Or shall the saw exalt itself against him who saws with it? As if a rod could wield itself against those who lift it up, Or as if a staff could lift up, as if it were not wood! Saul, who came from a humble background, was anointed king of Israel, yet his heart was revealed when the Lord exalted him, but he exulted in his own position, eventually coveting it so severely he became a fierce enemy of God. The Lord then removed His spirit from Saul and the true condition of the man became apparent to everyone. Even the great Solomon whose gifting, anointing, and prosperity were unsurpassed in some ways, seems to have taken for granted his abilities and wealth, and, somehow, rationalizing his blatant disobedience to God's law, he fell into idolatry and brought disaster to the Kingdom of Israel. This seems amazing, given the fact that Solomon's most precious gift was his wisdom. (Those with this gift should take note). Be careful how you handle the gifts and successes that God gives you! Enjoy His blessings as you serve in your family, business, or ministry – but never forget where it all comes from, and to whom the glory belongs, cause if you do, He will be sure to remind you. Spare yourself, Slay Agag now! Learn to Trust the Giver! Thank you for reminding me. I praise the Lord for divine appointments where the Spirit of the Lord gives me what to speak and I thank God for the encouragement given to those who hear what I have shared. Lord you give us people in our lives that you want to reach with Your Words and Wisdom. Lord I give you all the Glory, amen.